Kat Von D has never been one to shy away from controversy, but it's hard to tell her exact stance about online trouble. Either the LA Ink star-turned-beauty brand owner loves drama (which would appear to be the case based on her penchant for call-out videos) or drama just loves her (she's a reality TV star, don't forget!). Either way, it's a marriage she can't escape, unlike the one she had to Oliver Peck … not to mention her string of cancelled engagements. Through cheating scandals with award-winning actors and never-ending online feuds with fellow makeup moguls, Von D has managed to throw more shade than one of her best-selling eyeshadow palettes. Her feud with Jeffree Star was so biting that it probably could have won an Academy Award if they would finally just consider YouTube-based celebrity beefs to be an acceptable genre. With Kat Von D, we can't help but wonder what will come next. Will she ever make up with Jeffree Star? Will her marriage to Prayers singer Rafael Reyes last? Only time will tell. Long before Kat Von D was a makeup mogul, she was a tattoo artist-turned-reality star on TLC's Miami Ink. In 2007, after an alleged falling out with her fellow shop workers, she opened High Voltage Tattoo in West Hollywood and became the subject of her own spinoff, LA Ink. To many, the move to High Voltage seemed like an effort to squash drama among her Miami Ink coworkers, but it may have actually been pretty shady. According to a tattoo artist who worked with the star before she became famous, Von D opened her shop just one mile away from the tattoo shop where she got her start. With her enormous fame and onslaught of cameras, it totally threatened their business. Despite the competition, LA Ink was cancelled after four seasons — at least if you're talking to TLC. The network told Us Weekly that the fourth season would be the show's last, but Von D claimed it was never cancelled. "I love how me deciding not to continue doing LA Ink turns into [the show] being 'cancelled,'" she wrote in a now-deleted tweet. Though we don't know exactly what happened, Von D's alleged coworker did give some insight about what it was like to work with the star. In a post on Reddit, the tattooist admitted that working with Kat was "one of the low points of [his] personal career." Yikes. If you want to spark outrage on Twitter, sexualizing teenagers is always a foolproof route. Von D, who seems to be a magnet for controversy, shocked the masses in 2015 when she launched a new shade of lipstick called "Underage Red." Immediately critics slammed the brand for how it sexualized underage girls and made light of pedophilia. Von D has never been one to apologize, so it's not surprising that she wrote a rambling Facebook post defending her decision. She claimed the bold red reminded her of a lipstick she wore when she was 16 and "will never apologize" for how she decides to name her products. She also noted that the shade was sold out despite the controversy (honestly, it was a pretty flattering cool-toned red, if can you ignore the ill-advised name). This wasn't the first time Von D stirred up drama with her lipstick labels. In 2013, the shade "Celebutard" was pulled from Sephora stores after customers complained about it mocking the disabled. Though Sephora apologized to customers, Von D did not. 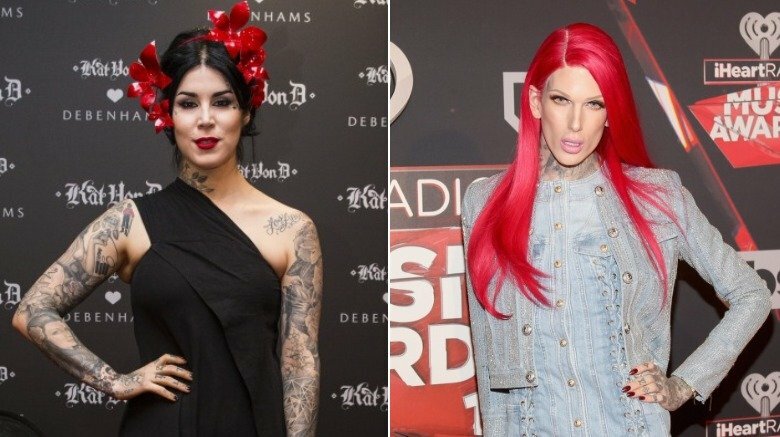 Kat Von D and Jeffree Star's feud is like the Taylor Swift-Kanye West beef of the makeup world. It won't go away, and no one comes out looking that good. Is it possible to call someone out for something you're guilty of, too? Absolutely. Is it advisable? Who knows in the world of YouTube. Either way, Von D got her clicks. 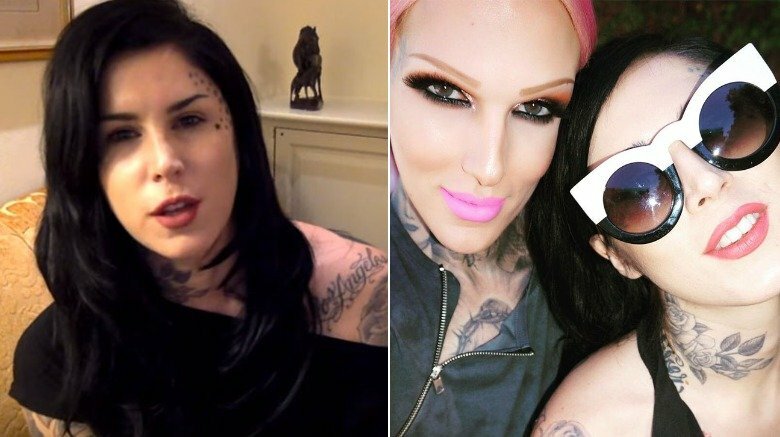 The drama erupted in 2016 when Von D announced she was parting ways with fellow makeup mogul and former BFF Jeffree Star. Since her public feuds are usually as dramatic as her eyeshadow looks, she decided to announce their split in a now-deleted Instagram post and YouTube video. In the post, she put a nearly 10-year-old photo of Star inside a red circle with a line through it and accused him of promoting drug use, racism, and bullying. Star did have some controversy surrounding a more than 12-year-old video that depicted him shouting racial slurs. The former MySpace star has since apologized for his "disgusting, vile, nasty and embarrassing" comments. That didn't stop Von D from calling him out years later, seemingly ignoring her similar controversy. In 2008, the tattoo artist was accused of anti-Semitic behavior after she appeared to have written "Burn in hell, Jewbag" on a signed headshot. She claimed the headshot was forged. Wait, who launched Jeffree Star's makeup brand, again? Kat Von D didn't stop at accusing her former best friend of cyberbullying and racism. She also took credit for launching his wildly successful makeup brand and claimed Star wouldn't be where he was without her. According to Von D's scathing YouTube video, Star was "kind of not doing anything" with his career when she hatched the idea for his makeup brand in her living room. "I went to such great lengths. I even hooked him up with a factory that was actually producing my Everlasting liquid lipstick formula plus a lot of my eyeshadows at the time," she said, adding that she "basically got Jeffree a meeting over there to see if he could start his own makeup line." Star, however, sang a completely different tune and denied Von D's claims in a video response. According to the former MySpace star, he wasn't "doing nothing" with his career when he stepped away from music. He had a successful clothing line, was growing as an online influencer and was "setting himself up to launch a brand." He admitted that Von D was supposed to be the investor behind Jeffree Star Cosmetics but bailed at the last minute (according to him, he was totally ghosted even though they confirmed her investment in various emails). As a result, he poured his life savings into his first few shades of liquid lipstick, which, thankfully for him, paid off. After Von D took credit for launching Jeffree Star's brand and accused him of online bullying (while simultaneously bullying him online), she dropped a major bomb: Star stole his company's logo from a designer (and close personal friend) named BJ Betts. But did he actually? Von D claimed to have introduced Star to Betts, who helped him design preliminary logos for Jeffree Star Cosmetics. After sending over a few rough ideas, Star allegedly cut off all contact and refused payment. Von D claimed her former friend blocked her after bringing the situation up, but Star's account was completely different. In his own video, Star admitted that he hired Betts to get the ideas started but decided not to use the designer because he couldn't afford him. Instead, Star hired someone who worked on his clothing line. Though Von D revealed Betts' sketched-out ideas, Star claimed they were similar to logos he had used in the past. Von D was also allegedly unaware that Star had already been talking to BJ Betts' team about payment for sparking the initial ideas (despite the fact that he reportedly did not design the logo and packaging). "Now that my brand is successful, I wanted to take care of somebody who was work for hire and that had helped me in the beginning and inspired something," he said, adding that Betts had been paid. Kat Von D is an undeniably accomplished tattoo artist. We know the girl can draw and is definitely design-minded. She even lent her skills to ex-BFF Jeffree Star. According to People, she has drawn most of the makeup mogul's many tattoos. Since launching her makeup brand in 2008, Von D has touted the fact that she's designed and drawn all of the artwork on her makeup's packaging. In a 2015 interview with Pages Digital (via Allure), Von D spoke about painstakingly drawing the repeated rose pattern on her Everlasting liquid lipstick tubes and blush packaging. Yet, Star revealed that Von D isn't actually responsible for all of her packaging's artwork. "I know Kat has always said she does all of her artwork for all of her packaging, but BJ [Betts] has done lettering for some of her palettes," he said in a YouTube video response. Von D has admitted that Betts contributed graphics to some of her YouTube videos, but she hasn't commented on him designing parts of her packaging. Was she the rebound girl? In 2010, the world learned that Jesse James had the audacity to cheat on Oscar-winner (and America's sweetheart) Sandra Bullock.The news came out days after Bullock took home the Oscar for The Blind Side and four years after the couple started the process to adopt a child. Needless to say, Miss Congeniality deserved better. She subsequently ended their five-year marriage and became a single mother to then-three-month-old Louis. James quickly moved onto Kat Von D, who appeared to be some sort of whirlwind rebound. While 2010 was arguably the worst year of Bullock's life (aside from finally realizing her dream as a mother), James told People it was the "best year" of his. Less than a year after his divorce was finalized, he was engaged to Von D, and the couple flaunted their relationship all over social media. He even shamelessly went on the record to say that the tattoo artist was "100 percent" better in bed than his former spouse. About six months later, Von D called off the wedding. 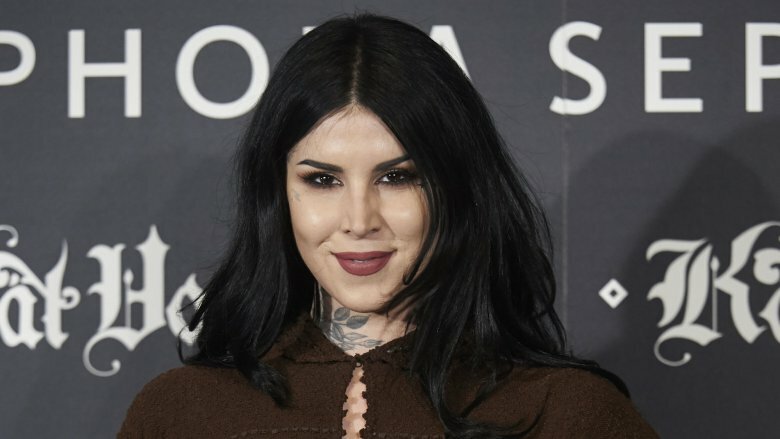 Despite Jesse James's history of infidelity, Kat Von D had initially decided to marry him anyway. Of course, you can guess what happened next. Von D called off the engagement six months after it was first announced (and after getting a rather ill-advised tattoo of his face). She claimed the motorcycle mogul had cheated on her with at least 19 different women. Where does one even meet 19 different women without getting caught by paparazzi just once? Von D took to her weapon of choice — a lengthy Facebook post — and called out her former fiancé. In the post, which was titled "Thank You, Jesse James," Von D claimed to have encountered the 19th girl "to add to the list of people Jesse cheated on me with during this last year." She also admitted that she was tired of "getting mistaken" for the person who broke up James' marriage to Bullock. Though James didn't comment on the claims, a source close to the star told People they were ridiculous. Are they, though? We're not going to say we told you so (even though Von D admitted she deserves that) because the pain of having to get your ex's face lasered off your arm is bad enough. Kat Von D must be rather unlucky in love because she wasn't just allegedly cheated on by former fiancé Jesse James. She also claimed to have been cheated on by her one-time fiancé and DJ Deadmau5. About a year after breaking things off with James, Von D took her relationship with on-again, off-again boyfriend Deadmau5 to the next level. He proposed to the star on Twitter with a picture of the ring, and she accepted. Weird? Yes, but it's the new millennium. The same engagement that began on the social network also ended on the social network (and so did all the arguments that ensued afterwards). Von D initially sparked the drama when she tweeted about dumping Deadmau5 after he cheated on her. Deadmau5 took to Facebook to refute her claims. According to the musician, he had only been with another woman while the pair were broken up. They got back together, and he proposed shortly thereafter. Months later, they amicably split, but Von D still claimed to have screenshots proving he had cheated. Deadmau5 has since deleted his proposal, and Von D deleted her scathing Tweetstorm, but the memory seems to have outlived even her longest-lasting liquid lipstick. 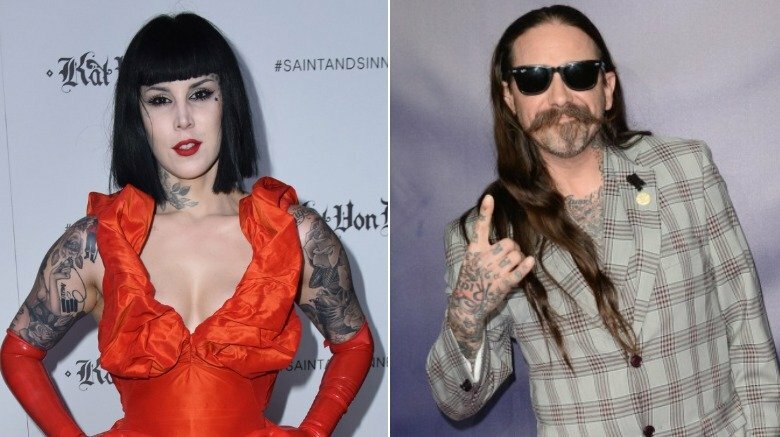 Kat Von D has been embroiled in a couple high-profile cheating scandals, and none of them ever seem to involve any wrongdoing on her part — unless you talk to her ex husband, Oliver Peck. Peck, who owns Elm Street Tattoo in Dallas, Texas, was married to Von D from 2003 to 2007. In a statement given to In Touch, Peck claimed the reality star consistently ruins her personal relationships. He accused her of "[screwing] over every friend she's had" and of cheating on him throughout their marriage. In a press release, which was reposted by the Huffington Post, Peck claimed his former wife changed after finding fame. She allegedly drank so much every day that she would throw up. Eventually, she got sober in 2008. It should be noted that In Touch also falsely states that they were only married for two years (unless they split in 2005 and finalized the divorce in 2007). If they're to be believed, Von D is a hypocrite. If they're not, she's still got some pretty horrible taste in men. 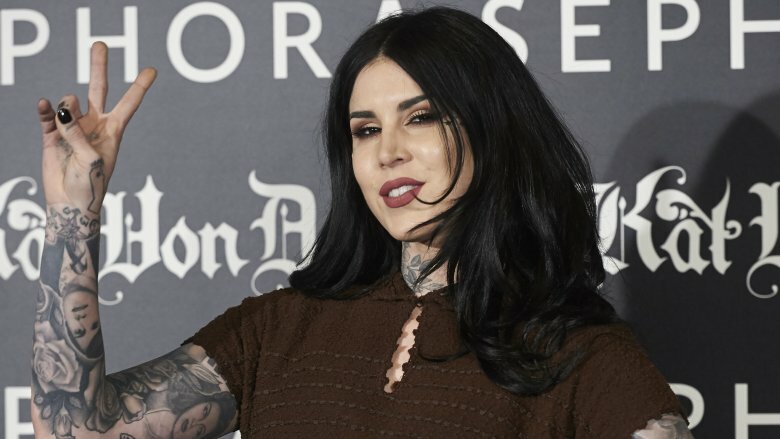 Kat Von D has been pretty vocal about her stance on President Donald Trump (she can't stand him), but it's hard to believe she'd disqualify a bona fide Instagram contest winner over their political views. So, is that what actually happened? Von D found herself surrounded by controversy yet again when her beauty brand sponsored an Instagram competition. The winner was supposed to get an all expenses paid trip to the Saint and Sinner perfume relaunch party and a $500 Sephora gift card. Makeup artist Gypsy Freeman was chosen out of thousands of contestants because of her striking image, but there was apparently one problem: She was a Trump supporter. According to the Kansas City Star, Freeman received a direct message from Von D after winning the contest. The LA Ink star allegedly wrote that she needed to draw "a personal line in the sand between myself and anyone who supports that man" and had a hard time inviting someone to her event who supported such an "anti-feminist, anti-homosexual/LGBT, anti-immigrant, and anti-climate change fascist." Freeman ended up not attending the party, and all evidence of the contest was scrubbed from Kat Von D Beauty's social media accounts. Jenn Bischof, the photographer who took Freeman's prize-winning photo, attended the event instead. Despite what it looks like, Von D claimed that Freeman wasn't banned from the party. She allegedly decided not to come to the launch all on her own. Can an eyeliner really romanticize mental illness? Kat Von D truly broke down gender barriers when she announced her collaboration with Green Day frontman Billie Joe Armstrong. 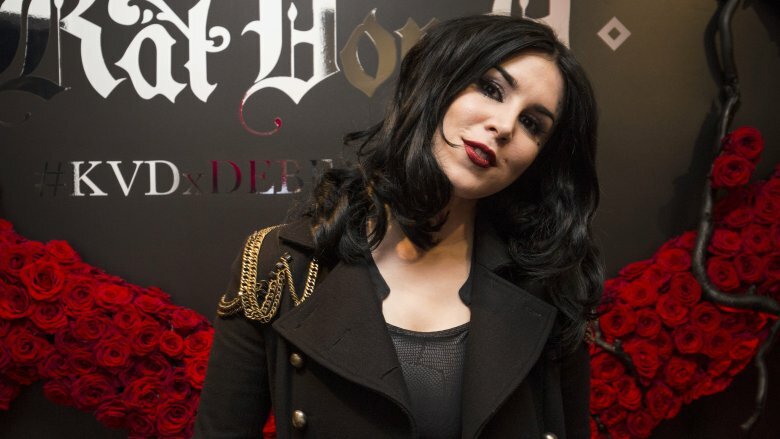 The punk rocker and eyeliner enthusiast launched a limited edition eyeliner through Kat Von D Beauty and named it after their iconic song "Basket Case." Unfortunately, the Basket Case Anti-Precision liner caused quite the stir because of an interesting choice in branding. Von D and Armstrong channeled an iconic photo of Sid Vicious and Nancy Spungen in their promotional images. For punk icons, you would think it made sense, but it didn't sit well for a number of beauty fans. Vicious and Spungen had a famously dark relationship that was marred with domestic violence and mental illness. It ended with Spungen's mysterious murder at the Chelsea Hotel and Vicious' infamous overdose. Because of this, Von D was accused of romanticizing domestic violence and mental illness. The internet comments ranged from calling the campaign a "morally wrong" "disgrace" to accusing Von D of using mental illness as a "fashion statement." Von D fired back in a couple Instagram comments (via Yahoo) and accused commentators of "nitpicking a campaign that has nothing to do with mental illness." 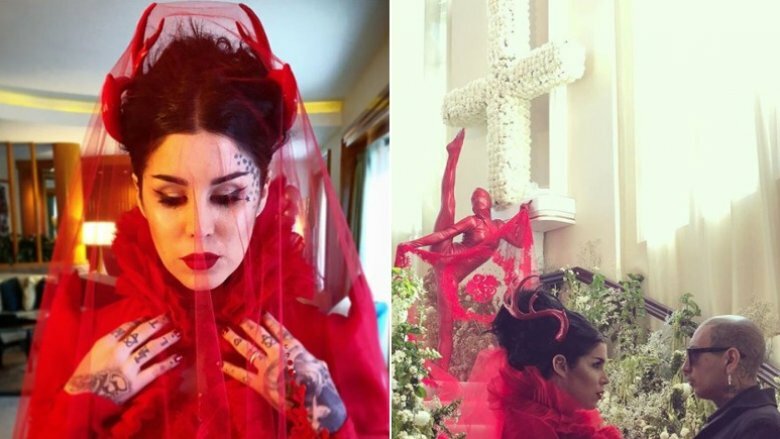 If all the evidence above wasn't enough to prove that Kat Von D has a not-so-secret shady side, throwing a major nod to the devil on her wedding day would certainly be a red flag — a blood-red flag. In June 2018, Von D tied the knot with Prayers musician Rafael Reyes. She ditched the traditional idea of a white wedding gown and opted for a bold, blood-red dress custom-designed by Adolfo Sanchez. Of course, we didn't expect the tattoo artist to walk down the aisle in anything conventional, but this bordered on a Halloween celebration (if Halloween was couture). Instead of donning a Coachella-chic flower crown or bedazzled tiara like the brides of Pinterest, Von D accessorized her dress with two full-on devil horns. Often people bring God into their nuptials, but Von D decided to bring in Satan. Are you trying to tell us something, girl?